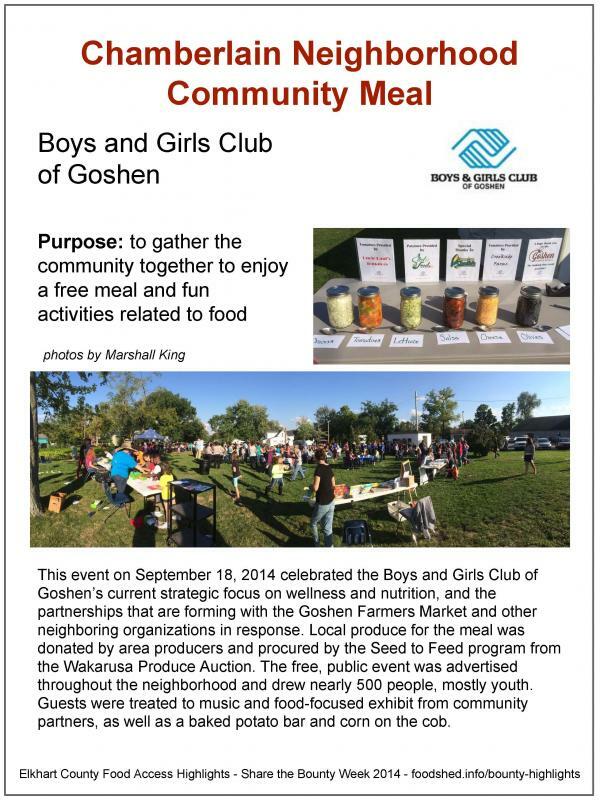 This event on September 18, 2014 celebrated the Boys and Girls Club of Goshen’s current strategic focus on wellness and nutrition, and the partnerships that are forming with the Goshen Farmers Market and other neighboring organizations in response. Local produce for the meal was donated by area producers and procured by the Seed to Feed program from the Wakarusa Produce Auction. The free, public event was advertised throughout the neighborhood and drew nearly 500 people, mostly youth. Guests were treated to music and food-focused exhibit from community partners, as well as a baked potato bar and corn on the cob.